The brand new SKY3DS+ .. Update: August 2, 2018. Sky3DS+ Plus Supports All 3DS, 2DS, 3DS XL and NEW 3DS consoles up to version 11.8.0 All of the amazing features of the original Sky3DS with the added benefit of even better compatibility and much easier to use now than ever before. The Sky3DS+ is fully updated with some great new features and functions. Not only does it support even the NEWEST 3DS Games it now supports Homebrews as well. With the new two button system, it's easier than ever to quickly select your game as you scroll forward and back and scroll through the games on your Sky3DS+ card using the buttons. Unlike Sky3DS that offered absolutely no upgradable Firmware support, this new version has fully upgradeable firmware and we include the USB update cable for. All this means that you can play More 3DS Games, you can run Homebrew software/tools/games and you can use this card Much Easier than before. Switch games by going back and forth with the two orange buttons on the card. Much easier to use than the previous version of Sky3DS cards. Sky3DS+ is quick and easy, just copy and paste your files and play, no more disk writer needed. Support any 3DS system version(including the newest V11.3.0). 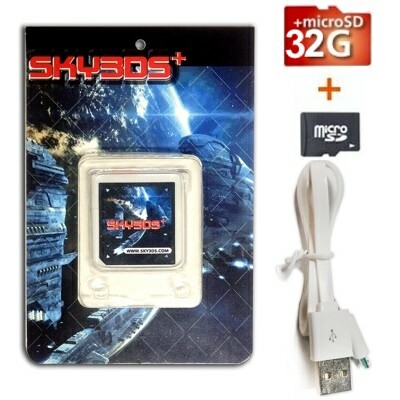 Click the button below to add the Sky3DS+ and 32GB Micro SD to your wish list.